Condensate POT / Seal POT is used at places where there is large degree of pressure & flow changes in line so condensate pots are installed before the instrument to get smooth flow measurement of pressure required. 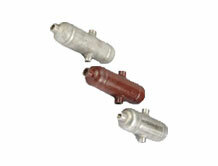 Condensate pots protects the instruments from damage to abnormal flow, pressure changes. Condensate pots can be manufactured using quality C.S or SS material. WE make use of seamless pipes for manufacturing Condensate pots thus condensate pots manufactured by us can withstand high pressure and temperature. this condensate pots are manufactured as per drawing or as per pipe schedule required by our clients. 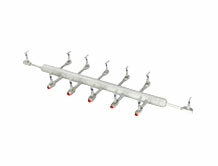 Air header or Distribution manifold finds wide application in various fields where in distribution of Air, Gas is required i.e from main line the fluid is to be distributed to various other lines. This air headers can be given various no of outlets at desired outlets and at desired distances as the piping arrangement may be. Standard materials and seamless material pipes makes our range of air manifold most sturdy and long life. We use quality Needle valves for superior flow control. We can also provide Drain valve at the manifold exit point. Brackets for wall mounting if required can be provided.